Sustainable Management of Arthropod Pests of Tomato provides insight into the proper and appropriate application of pesticides and the integration of alternative pest management methods. The basis of good crop management decisions is a better understanding of the crop ecosystem, including the pests, their natural enemies, and the crop itself. 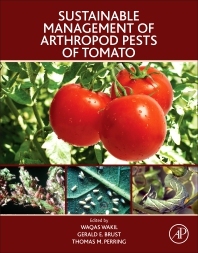 This book provides a global overview of the biology and management of key arthropod pests of tomatoes, including arthropod-vectored diseases. It includes information that places tomatoes in terms of global food production and food security, with each pest chapter including the predators and parasitoids that have specifically been found to have the greatest impact on reducing that particular pest. In-depth coverage of the development of resistance in tomato plants and the biotic and abiotic elicitors of resistance and detailed information about the sustainable management of tomato pests is also presented. Waqas Wakil is an Assistant Professor in the Department of Entomology at University of Agriculture, Faisalabad (UAF), Pakistan. He has 15 years teaching and research experience and secured two Ph.D.'s - first from University of Agriculture, Faisalabad, Pakistan and then from Trier University, Trier, Germany. He has worked in a number of international research laboratories as Visiting Scientist/Professor. His research mainly spans in the fields of biological control, insect pathology, sustainable and integrated pest management of vegetable and stored grain insect pests. He has presented his research in number of international conferences as Invited Speaker and published 80 peer-reviewed research manuscripts in scientific journals. He has successfully completed various research grants as Lead Scientist and developed bio-intensive integrated pest management strategies in vegetable crops using microbial agents and other eco-friendly control practices. He has mentored four Ph.D. and 39 M.Phil. students at UAF. He is the member of several professional societies, Editorial board of scientific journals and the Fellow of Royal Entomological Society (UK) and a Fulbright Scholar (USA). Gerald Brust has conducted integrated pest management research in vegetables and outreach to growers in the Eastern United States for over 25 years. During this period he has over 150 publications dealing with insect pest management as well as horticultural topics. He has authored or co-authored 9 chapters in various books that involve insect pest management of vegetables (tomatoes, cucurbits, sweet corn) and the importance of Carabid beetles in agroecosystems. He has presented his research findings to other professionals at national and international meetings. He has worked internationally developing new integrated pest management strategies for tomatoes and horticultural plants in developing countries. Gerald Brust has been asked to review over 150 manuscripts for publication by 23 different journals and served as co-editor of one on-line journal. Dr. Brust has taught “IPM of Horticultural Crops” and “Pesticide Use and Application” to students in Plant Science Programs. He has organizedseveral symposia on vegetable IPM issuesfor Entomological Society of America national and regional meetings. He was asked to present the “State of Tomato IPM in the United States” at the 2006 International IPM Meeting. Thomas M. Perring is a Professor of Entomology at the University of California Riverside (UCR), in Riverside, California, USA. He received his B.S. in Wildlife Ecology from Oklahoma State University in 1978, his M.S. in Entomology from Texas Tech University in 1980, and his Ph.D. from the University of Nebraska in Entomology in 1983. He has been a member of the UCR faculty since 1983, where he is involved in teaching, research and service. His research focuses on the development of environmentally and economically sustainable pest management programs for insects and mites that are threats to agricultural crops, particularly in desert agroecosytems. A subset of this research effort has been studies on the epidemiology and management of arthropod vectors of plant pathogens in a variety of agricultural commodities. He is actively involved in training post-graduate researchers, and graduate and undergraduate students. Dr. Perring’s research efforts have resulted in the publication of 125 reviewed scientific articles and book chapters. In addition, he has held administrative positions of Associate Dean in the College of Natural and Agricultural Sciences, and Associate Vice-Provost of Undergraduate Education at UCR.